The nature of how business is conducted and organizations function is rapidly evolving, as a result of fundamental changes in demographic, technological, and economic realities. Workers are increasingly Web savvy; they use and like consumer Web 2.0 collaboration applications on the public Internet and are expecting and demanding similar software user experiences in the enterprise. Enterprises themselves are changing. Organizations are more networked, internally and with other entities, as a result of improvements in computing networks, globalization, and an increasingly mobile workforce. All the while, IT department budgets have shrunk during the current recession, forcing IT staff to tackle an ever-­growing list of corporate computing requirements and projects with fewer human resources. These challenges are driving organizations and their workers to think differently and to seek new content management strategies and solutions that complement existing content management systems. Continuing to manage and share content solely with "yesterday's logic" is not a viable option. One promising approach is Cloud Content Management. This Gilbane Group Beacon examines how large-­scale trends are changing enterprise collaboration and content sharing requirements and expectations. It defines Cloud Content Management, an emerging set of content management practices and a category of software that supports those practices. 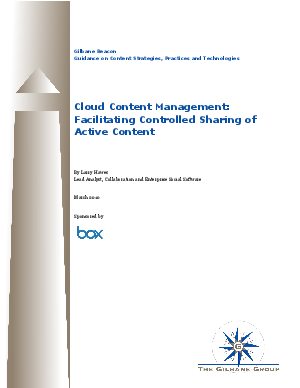 Lastly, it demonstrates how Cloud Content Management is a value-­adding complement to Enterprise Content Management today and has the potential to expand its ability to control the sharing of content more tightly in the future.